An assistant city solicitor is being investigated in connection with anti-Trump graffiti. A city attorney involved in an anti-Donald Trump vandalism incident, caught on camera, made a "dumb mistake," and remains in his job for now Mayor Kenney said Thursday. 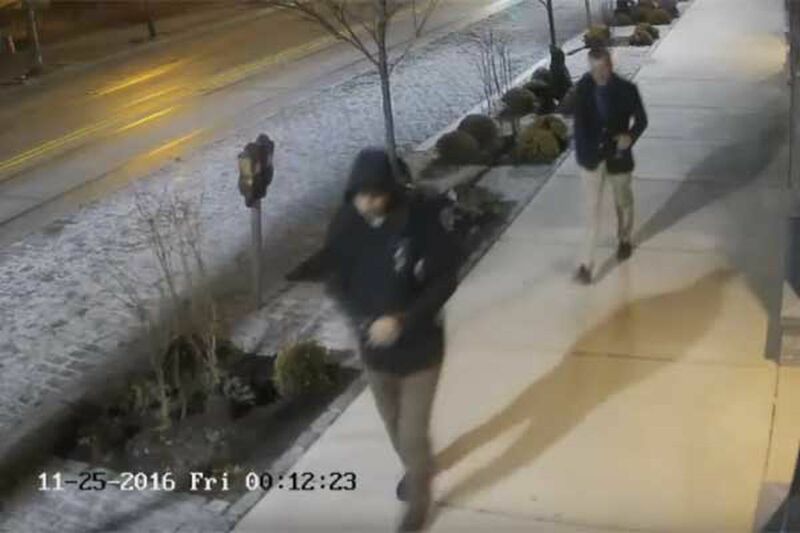 Duncan Lloyd, an assistant city solicitor, was identified in surveillance footage that captured Lloyd and a second man walking along Germantown Avenue in Chestnut Hill on Nov 25. In the footage, Lloyd is seen wearing a blue blazer and holding a glass of wine, filming or taking photos, while a second man spray paints "F--- Trump," on the wall of a newly opened Fresh Market. "It's still working out. It's certainly hateful and inappropriate and unacceptable...but people are human beings and they make mistakes and it's a dumb mistake," Kenney said. "It's hateful graffiti, hateful graffiti is never acceptable whether it's a city employee or not." Lloyd has not returned calls for comment. First Deputy City Solicitor Craig Straw confirmed on Wednesday that Lloyd, who has worked for the Law Department since 2011, is one of two men in the video. "We do not condone this type of behavior from our employees," Straw said. "To my knowledge, Mr. Lloyd has already contacted the Philadelphia police and is cooperating with them. We will decide on a course of action once we obtain more information about the investigation." Lloyd, 32, attended Germantown Friends School and graduated from the University of Pennsylvania and Temple University's Beasley School of Law, according to his LinkedIn page. He makes $63,207 a year, working in the Labor and Employment unit, representing the city mostly in federal and state discrimination lawsuits. On his LinkedIn page he wrote of the job, "As a result of these responsibilities, I hear the craziest stories - ones regularly driven by the unreasonable mores of lust, anger, passion, and envy." The story he's wrapped up in now occurred around midnight Friday at the Fresh Market at 8200 Germantown Ave.
Police released a video which shows Lloyd, wine glass in hand, holding up his cellphone as the second man, described as 20 to 30 years old, 6 feet tall, medium build, and wearing a blue hooded jacket, spray-paints the wall. Police have estimated the damage at between $3,000 and $10,000. Since Election Day, pro- and anti-Trump graffiti have been reported throughout the city. In early November, spray-painted swastikas, racist graffiti, and references to President-elect Donald Trump and Nazi Germany appeared in South Philadelphia. Anti-Trump graffiti have been reported on bus shelters and on the exterior wall of City Hall, where "Not My President" was spray-painted and removed Nov. 12. Mayor Kenney has denounced the destruction of property, which mirrors incidents nationwide. The city's Republican Party wasted no time in calling for Lloyd's dismissal. "If the image of an upper-middle-class city attorney clad in a blazer and sipping wine while vandalizing an upscale grocery store with an anti-Trump message strikes you as perhaps the most bourgeois sight imaginable, that's because it is," said Joe DeFelice, chairman of the Philadelphia Republican Party. "Did the extra glass of Shiraz give him some sort of delusional confidence that there are no cameras on Germantown Avenue? The taxpayers should be entrusting exactly none of our faith into this man. He should be fired from our city's Law Department immediately."